Lunar Legend introduced collectible cards as an extra in the game. 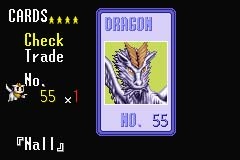 You can collect cards of characters, dragons, enemies, and bosses, by encountering them in the game or either buying or finding them in special places in Lunar. The cards don't do anything game-wise, but they do showcase some of the character animations and are tradeable with the link cable. We have nearly all of the cards from the game as images here. 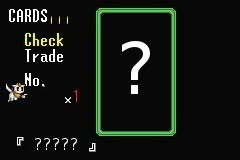 We're still missing 10 card images: 30, 48, 50, 63, 106, 114, 123, 126, 133, and 162 -- if you have images of any of these, we'd definitely appreciate the help. Also, 6 cards were contributed by LunarNET forums member MC RaZaR: 5, 7, 16, 22, 26, and 37. Most character cards you can purchase from the card shop in Meribia on Black Rose Street, though most are only obtainable in the epilogue. A few other character cards can be purchased from card traders in other parts of Lunar, and the last two are in treasure chests. #000 - Alex 1 - Card Shop on Black Rose Street. #001 - Alex 2 - Card Shop on Black Rose Street. #002 - Alex 3 - Card Shop on Black Rose Street. #003 - Alex 4 - Card Shop on Black Rose Street. #004 - D. Alex 1 - Card Shop on Black Rose Street. #005 - D. Alex 2 - Card Shop on Black Rose Street. #006 - D. Alex 3 - Card Shop on Black Rose Street. #007 - D. Alex 4 - Card Shop on Black Rose Street. #008 - Luna 1 - Card Shop on Black Rose Street. #009 - Luna 2 - Card Shop on Black Rose Street. #010 - Luna 3 - Card Shop on Black Rose Street. #011 - Luna 4 - Card Shop on Black Rose Street. #012 - Nash 1 - Card Shop on Black Rose Street. #013 - Nash 2 - Card Shop on Black Rose Street. #014 - Nash 3 - Card Shop on Black Rose Street. #015 - Hi-Nash - Trade card 157 to card trader at the second Althena's Spring or Meribia (on the docks) after the Grindery. #016 - Mia 1 - Card Shop on Black Rose Street. #017 - Mia 2 - Card Shop on Black Rose Street. #018 - Mia 3 - Card Shop on Black Rose Street. #019 - Mia 4 - Card Shop on Black Rose Street. #020 - Jess 1 - Card Shop on Black Rose Street. #021 - Jess 2 - Card Shop on Black Rose Street. #022 - Jess 3 - Card Shop on Black Rose Street. #023 - Jess 4 - Card Shop on Black Rose Street. #024 - Kyle 1 - Card Shop on Black Rose Street. #025 - Kyle 2 - Card Shop on Black Rose Street. #026 - Kyle 3 - Card Shop on Black Rose Street. #027 - Kyle 4 - Card Shop on Black Rose Street. #028 - Tempest - Card Shop on Black Rose Street. #029 - Fresca - Card Shop on Black Rose Street. #030 - Ramus 1 - Card Shop on Black Rose Street. #031 - Ramus 2 - Card Shop on Black Rose Street. #032 - Ghaleon 1 - Card Shop on Black Rose Street. #033 - Ghaleon 2 - Card Shop on Black Rose Street. #034 - Ghaleon 3 - Card Shop on Black Rose Street. #035 - MEmperor - Card Shop on Black Rose Street. #036 - Laike 1 - Card Shop on Black Rose Street. #037 - Laike 2 - Card Shop on Black Rose Street. #038 - Nall 1 - Card Shop on Black Rose Street. #039 - Nall 2 - Card Shop on Black Rose Street. #040 - Mel - Card Shop on Black Rose Street. #041 - Xenobia - Trade card 154 to card trader at the first Althena's Spring. #042 - Phacia - Trade card 152 to card trader at the first Althena's Spring. #043 - Royce - Trade card 153 to card trader at the first Althena's Spring. #044 - Myght - Card Shop on Black Rose Street. #045 - Taben - Card Shop on Black Rose Street. #046 - ME Ghal. - Trade card 158 to card trader in Meribia (on the docks) after the Grindery. #047 - Evil Alt. - Trade card 159 to card trader in Meribia (on the docks) after the Grindery. #048 - 4 Dyne - Card Shop on Black Rose Street. #049 - 4 Ghaleon - Card Shop on Black Rose Street. #050 - 4 Lemia - Card Shop on Black Rose Street. #051 - 4 Mel - Card Shop on Black Rose Street. #052 - Althena - Card Shop on Black Rose Street. #053 - Barrel - Chest in the Protector Cave. #054 - D. Grave - Meribia's Secret Sewers in small warehouse next to the pub in Meribia (after you get Mia and Kyle back in your party after the Grindery mission, this warehouse can be entered). Nall's card is easy to find in the Goddess Tower chest. For the other four, you'll need to first talk to the guy in Saith (on the main path in town) after you return to Caldor Island with Ghaleon, and he'll tell you about the Old Hag's house. Then, you need to visit her after encountering each dragon. #055 - Nall - Goddess Tower (in a chest). #056 - Quark - Old Hag on Caldor Isle (after Quark is captured by Ghaleon and before the Red Dragon Cave). #057 - Amelia - Old Hag on Caldor Isle (after the Red Dragon Cave and before the Blue Dragon Cave). #058 - Cyan - Old Hag on Caldor Isle (after the Blue Dragon Cave and before the Black Dragon Fortress). #059 - Rubeus - Old Hag on Caldor Isle (after the Black Dragon Fortress). Getting all enemy cards is tough; you need to make sure you get everything from areas in the game you go through only once (like the Hispaniola, Ancient Vane, Crystal Tower, Meribia during the Vile Tribe attack, Iluk Field, Dragon Caves/Fortresses, Lyton Cave, anywhere on the Frontier, the Grindery, and the City of Althena/Goddess Tower), and you need to make sure to go through all secret areas (Meribia's Secret Sewer and the Protector Cave). There are two items that will help: "Card Hunter" causes enemies to drop cards more frequently (in a red chest at the Old Hag's house), and "Card Hunter S" lets you obtain a card from every battle (in the Protector Cave). #060 - Burgdog - Defeat Burgdog (Weird Woods). #061 - Deathcap - Defeat Deathcap (Weird Woods). #062 - Pirate 1 - Defeat Pirate 1 (Hispaniola). #063 - Pirate 2 - Defeat Pirate 2 (Hispaniola). #064 - Flytrap - Defeat Flytrap (Weird Woods). #065 - Ammonite - Defeat Ammonite (Sewer - Meribia). #066 - Fatsnake - Defeat Fatsnake (Sewer - Meribia). #067 - KillFish - Defeat Killfish (Sewer - Meribia). 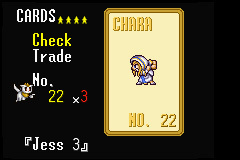 #068 - Wisp - Defeat Wisp (Sewer - Meribia). #069 - Todstool - Defeat Todstool (Ancient Vane). #070 - Gunfoot - Defeat Gunfoot (Ancient Vane). #071 - Icedog - Defeat Icedog (Ancient Vane). #072 - Batlefly - Defeat Batlefly (Ancient Vane). #073 - Dethmoth - Defeat Dethmoth (Nanza Mountain). 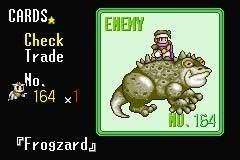 #074 - Wildboar - Defeat Wildboar (Nanza Mountain). #075 - Earthel - Defeat Earthel (Nanza Mountain). #076 - Antlion - Defeat Antlion (Nanza Mountain). #077 - Pudgyboa - Defeat Pudgyboa (Lann Island). #078 - The deep - Defeat The deep (Lann Island). #079 - Cyclops - Defeat Cyclops (Lann Island). #080 - Piranha - Defeat Piranha (Lann Island). #081 - C. Mirror - Defeat C. Mirror (Crystal Tower). #082 - Meteor - Defeat Meteor (Crystal Tower). #083 - C. Knight - Defeat C. knight (Crystal Tower). #084 - Flymet - Defeat Flymet (Crystal Tower). #085 - Rook - Defeat Rook (Meribia - during Vile Tribe attack). #086 - Gargoyle - Defeat Gargoyle (Meribia - during Vile Tribe attack). #087 - Necroman - Defeat Necroman (Meribia - during Vile Tribe attack). #088 - Darklord - Defeat Darklord (Meribia - during Vile Tribe attack). #089 - Battlebat - Defeat Battlebat (Damon's Spire). #090 - Homunc - Defeat Homunc (Damon's Spire). #091 - Kyklops - Defeat Kyklops (Damon's Spire). #092 - Gigant - Defeat Gigant (Damon's Spire). #093 - Flufball - Defeat Flufball (Iluk Field). #094 - Puffball - Defeat Puffball (Iluk Field). #095 - Maneater - Defeat Maneater (Iluk Field). #096 - Devilfly - Defeat Devilfly (Iluk Field). #097 - Blob - Defeat Blob (Red Dragon Cave). 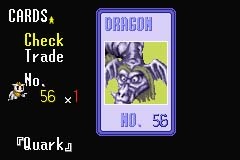 #098 - Burner - Defeat Burner (Red Dragon Cave). #099 - Firel - Defeat Firel (Red Dragon Cave). #100 - Scorpion - Defeat Scorpion (Red Dragon Cave). #101 - Mindblow - Defeat Mindblow (Lyton Cave). 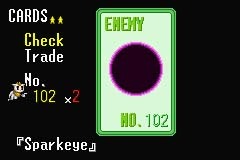 #102 - Sparkeye - Defeat Spark eye (Lyton Cave). 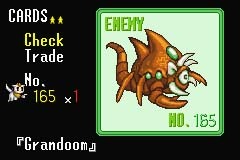 #103 - Giga ant - Defeat Giga ant (Lyton Cave). #104 - Merlance - Defeat Merlance (Blue Dragon Shrine). #105 - Spikerat - Defeat Spike rat (Blue Dragon Shrine). 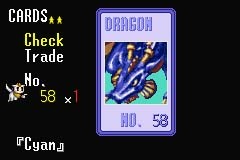 #106 - Waterel - Defeat Waterel (Blue Dragon Shrine). #107 - Slime - Defeat Slime (Blue Dragon Shrine). #108 - Dryad - Defeat Dryad (Tamur Pass). #109 - Icepump - Defeat Ice pump (Tamur Pass). #110 - Swarmer - Defeat Swarmer (Tamur Pass). 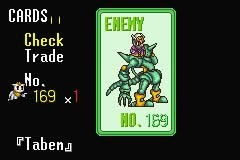 #111 - Shrieker - Defeat Shrieker (Tamur Pass). #112 - IronMan - Defeat IronMan (Tamur Pass). #113 - Sorcerer - Defeat Sorcerer (Tamur Pass). #114 - Zane - Defeat Zane (Tamur Pass). #115 - Magichat - Defeat Magichat (Myght's Tower). #116 - Spector - Defeat Spector (Myght's Tower). #117 - Mechstar - Defeat Mechstar (Myght's Tower). #118 - M. Mirror - Defeat M. Mirror (Myght's Tower). #119 - Shroom - Defeat Shroom (Forest of Illusion). #120 - Ambush - Defeat Ambush (Forest of Illusion). #121 - Yeti - Defeat Yeti (Forest of Illusion). #122 - Inceptor - Defeat Inceptor (Forest of Illusion). #123 - Torment - Defeat Torment (Black Dragon Fort). #124 - Coronast - Defeat Coronast (Black Dragon Fort). #125 - Chaos - Defeat Chaos (Black Dragon Fort). #126 - Goth - Defeat Goth (Black Dragon Fort). #127 - Piper - win the battle with Piper (Cystal Tower). #128 - Zotto - win the battle with Zotto (Nanza). #129 - Mechtank - Defeat Mechtank (Talon Mine). #130 - Stalker - Defeat Stalker (Talon Mine). #131 - Sergeant - Defeat Sergeant (Talon Mine). #132 - Roc biter - Defeat Roc biter (Talon Mine). #133 - Driller - Defeat Driller (Ruid). #134 - Wyndham - Defeat Wyndham (Ruid). #135 - Baiken - Defeat Baiken (Ruid). #136 - D. Mirror - Defeat D. Mirror (Ruid). #137 - Ur Golem - Defeat Ur Golem (Grindery Bottom). #138 - Plankton - Defeat Plankton (Grindery Bottom). #139 - Disarmer - Defeat Disarmer (Grindery Bottom). #140 - Elemage - Defeat Elemage (Grindery Bottom). #141 - Arrofish - Defeat Arrofish (Grindery Top & Meribia's Secret Sewer). #142 - Killfang - Defeat Killfang (Grindery Top & Meribia's Secret Sewer). #143 - Archmage - Defeat Archmage (Grindery Top & Meribia's Secret Sewer). #144 - Bomangel - Defeat Bomangel (Grindery Top & Meribia's Secret Sewer). #145 - Gigadeth - Defeat Gigadeth (Althena City). #146 - Pikuni - Defeat Pikuni (Althena City). #147 - Gudeth - Defeat Gudeth (Althena City). #148 - Rig Horn - Defeat Rig Horn (Goddess Tower). 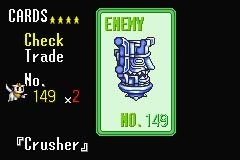 #149 - Crusher - Defeat Crusher (Goddess Tower). 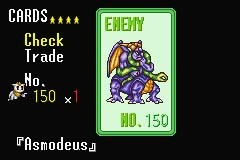 #150 - Asmodeus - Defeat Amadeus (Goddess Tower). #151 - Bomdevil - Defeat Bomdevil (Goddess Tower). #152 - Hellslug - Defeat Hellslug (Meryod Woods). #153 - No brainer - Defeat No brainer (Meryod Woods). #154 - Gorgon - Defeat Gorgon (Meryod Woods). #155 - Badbazz - Defeat Bad buzz (Meryod Woods). #156 - Ampshire - Defeat Ampshire (Forbidden Forest & Protector Cave). #157 - Hot foot - Defeat Hot foot (Forbidden Forest & Protector Cave). #158 - Vor Boar - Defeat Vor Boar (Forbidden Forest & Protector Cave). #159 - Nautilus - Defeat Nautilus (Forbidden Forest & Protector Cave). Boss cards are straightforward; you'll always get one after a boss battle. But there are two unique ones: you can only get Mel's card if you defeat Mel in Meribia (level up early in the game before you first meet him), and you can only get the Guardian card in the optional Protector Cave. #160 - Captain - win the battle with Captain. #161 - Rin-Rin - win the battle with Rin-Rin. #162 - Mel - win the battle with Mel. 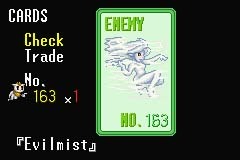 #163 - Evil mist - win the battle with Evil mist. 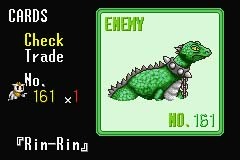 #164 - Frogzard - win the battle with Frogzard. #165 - Grandoom - win the battle with Grandoom. 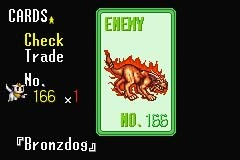 #166 - Bronzdog - win the battle with Bronzdog. #167 - Tempest - win the battle with Tempest. 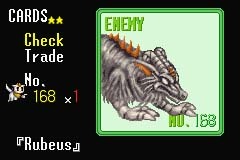 #168 - Rubeus - win the battle with Rubeus. #169 - Taben - win the battle with Taben. 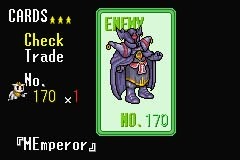 #170 - M Emperor - win the battle with M Emperor. #171 - Royce - win the battle with Royce. #172 - Xenobia - win the battle with Xenobia. #173 - Ghaleon - win the battle with Ghaleon. 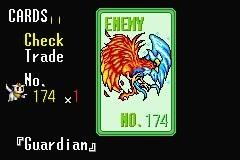 #174 - Guardian - win the battle with Guardian (Protector Cave).